The world is a topsy-turvy place. In times of turmoil people turn to the old, the familiar, the classic, for assurance of continuity and stability. Ah, those halcyon days! Perhaps the newspaper is not a place to seek solace, but as I was flipping through the Friday edition, usually a little lighter after the dread of another week, I noticed a story about Leonardo da Vinci (before the code made him famous). For many centuries people have pondered the understated smile on the Mona Lisa’s placid yet knowing face. Recent forensic-type investigations are now strengthening the old suggestion that the Mona Lisa was actually a self-portrait of the artist as a woman. Some will, no doubt, find such news distressing – a masculine artist portraying himself as feminine? (Surely such a thing has never been done before!) Most concerned of all would be the Religious Right, a group that seeks a god excelling in sharp distinctions. Either male or female, no intersexuals need apply! Over the past several months I have been reading Stephen Asma’s On Monsters, a book that can’t really be called “enjoyable,” although it has been eye-opening and informative. One of the recurrent themes throughout the book has been the fear of the liminal being conjoined with our growing understanding that sharp distinctions are rare. Ever since Freud it has been known (at least subconsciously) that people participate in aspects of both genders with social constructs determining which role is to be filled, feminine or masculine. Those who look honestly at the aggregate of the human race realize that we are all points on a continuum rather than simply members of one or the other gender. As Asma points out, however, we prefer distinctions. In painting himself as a woman perhaps Leonardo once again proved himself ahead of his time. Perhaps the Mona Lisa is a mirror we should long gaze into before judging others on the basis of artificial distinctions. This entry was posted in Books, Current Events, Feminism, Popular Culture, Posts and tagged Freud, gender, Leonardo da Vinci, Mona Lisa, On Monsters, Religious Right, Stephen Asma by Steve Wiggins. Bookmark the permalink. 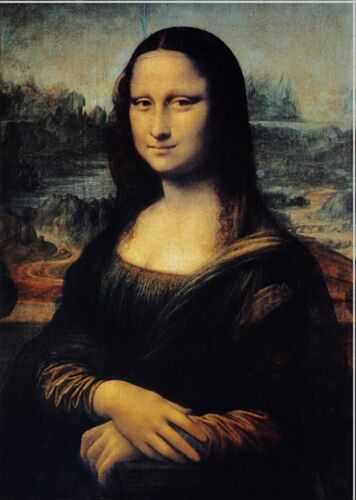 One thing that bugs me about people “studying” Mona Lisa’s smile is that why can’t she just be smiling. People smile when pictures are taken of them, why couldn’t she (or if it’s a fem version of Leo) just simply want to smile for the portrait (or request for a smile when being painted). In archaeology, one thing that I have been taught repeatedly is that usually the simple answer is the right one. Ah, the specter of intentionality raises its head once more! Who can guess what I intend by that remark? It’s also been demonstrated that the Shroud of Turin is actually also a self portrait of Da Vinci. Wonder what the religious right would have to say about THAT. Jesus was a gender confused painter who may or may not have been a gay athiest? Call me shallow and unrefined, but E Buzz Miller’s Art Classics comes to mind. Dan Akroyd on SNL circa 1977…. E. Buzz Miller: Now, the first one here is called Venus of Irbino, and it was painted in 1538 by a guy in Venice. And, this is for real, his name is spelled T-I-T-I-A-N. Titian! Honest to God”!